The below is a step-by-step instructional for setting up your blog. Except for the first step, these instructions need not be followed in any particular order. If you cloned the Blog Template, then you are presently an admin of the site. The top bar has an admins only link, and the side bar has admin-only options, but they will only show if you have created an Admin CSS Page. Thankfully, this process is simple. Simply click on the button below, press save, and return to this page. When you are finished, you should see a small cogwheel appear in the top bar. Post Navigation This navigation bar appears on all post pages. It contains a module that allows users to view entries based on date of creation. Recent Comments A list of all the recent comments that were made. Post Management A one-stop location from which to manage all of your posts. It will show any unfinished drafts that you need to publish. Making a post is a simple process. Follow the below steps in order to see how to get started with your blog website! First, you need to create a post page. You can do this from the side bar. If you have created an Admin CSS Page, then you will see a special section called the Admins Only Panel. On it is a text box that lets you type in the title of your new post. To make a post, type the title of the post into the box and press the Create Post button. Once your page is created, you can now edit the post. You will see a few major sections, all of which are explained here. First Paragraph The section labeled First Paragraph is where you should put the first paragraph of your post. This paragraph is what appears as a summary on the main posts page for your posts. You are technically allowed to put more paragraphs there if you want. Ultimately, you have the freedom! The Rest The section labeled The rest is for everything except the first paragraph. When you save the page, you will notice that the text in this section is placed underneath the text in the First Paragraph section. Hidden Notes Hidden notes will not appear to viewers, as they are only visible in the source code. This is for you to put special info. For example, if your post was a puzzle, you could put the answer of the puzzle here so that you do not forget it in the future. Feel free to use this box for whatever you need, even if you just leave it empty. Icon Every post allows you to specify an Icon, like , , or . This adds character to each post if you so desire it, appearing on the front page as well as the actual post page. By default, no icon will show, but if you click on the dropdown box, all the options available will appear. Cover Image Finally, you are allowed to upload your own cover images for posts. This image will replace the Icon. We recommend that the images you use have a 4:3 ratio for the best display. Publish? This field is used later for publishing. At the bottom of the edit page, you will see a save or cancel button. Clicking save will preserve all of your work so far. Note: Saving the page will not publish it at the same time. Posts will not appear on feeds until a post is published. This allows you to continue editing and modifying your post until you feel it is ready for the public eye. Once you feel your post is ready, it is time to publish. 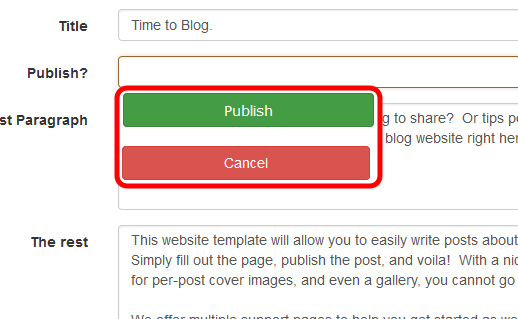 To publish a post, you will now be using the Publish? field that you might have seen. Click Edit, like you normally would to edit the page. Click on the text field next to the Publish? tag. This will cause a small confirmation window to pop up. Click the green Publish button. You will notice today's date appear in the field box. Your post will now be viewable on the main page and to your audience! This is what the publishing window looks like. Pressing the Publish button will fill in the field with the current date. You are actually allowed to modify the date if you feel it is necessary. However, it will not delay publishing; if you set the date to a future date, the post will still be published immediately. By default, its format is MM/DD/YYYY. Hide This will remove the post from the feed, but the content will still be viewable. This is good if you wish to undo the publishing process for the sake of editing. You can always unhide the page afterward. Hide Comments This hides all the current comments made on the post and prevents future comments from being made. This can be useful if your post induces controversy that your audience decides to discuss vehemently. Disable Comments Unlike the previous option, this will only prevent future comments from being made. Current comments can still be viewed. Delete This will remove the post from the feed and hide the content as well. The page still technically exists, but its content is effectively inaccessible. You always have the option of permanently removing the page via Wikidot's deletion option. Doing so, however, prevents the page from being resurrected. The Blog Template also offers a simple way for you to maintain a gallery of images. This page pulls in a set of photos from Flickr using the 'FlickrGallery' module. You can select photos by photo set ID, or just show all photos for your name. Read the the FlickrGallery documentation at this link for more details. By default, this site uses a theme called the Standard Theme. You may wish to deviate from the default shade of orange or replace the looks entirely. In this case, read the CSS Themes help page and visit the Themes Administration page for more details.